The Pure RO is a high-quality, reliable reverse osmosis water filtration system for use in commercial applications requiring purified water. This system is currently used worldwide in applications such as bottling plants, car washes, water stores, ice production, beverage production, manufacturing processes, aquariums, powder coating, hotels, livestock, agriculture, flower growing, and food industry applications. 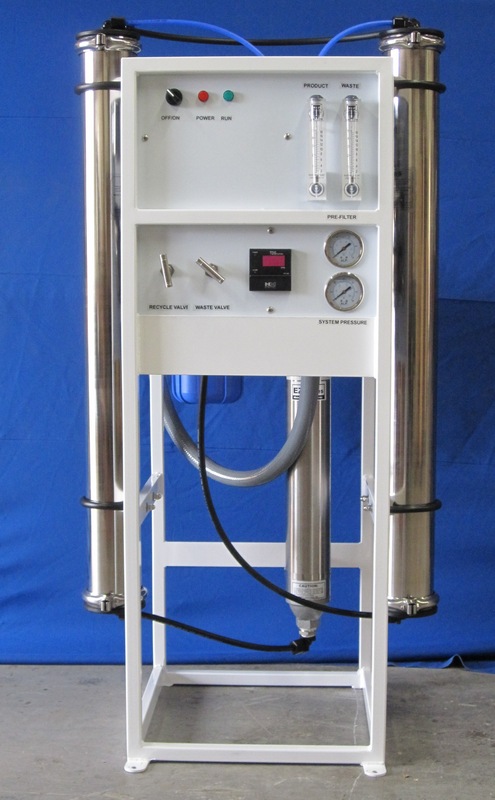 This unit is a frame mounted stand-alone reverse osmosis water purification system that is designed to consistently and efficiently produce pure water for a variety of purposes. This water filtration system can also be designed or modified to produce purified alkaline water in a very cost effective and easy method. The Pure RO reverse osmosis water filter system is available in multiple models to suit production levels ranging from 1,500 – 6,000 gallons a day. When building the system, we can adapt or modify the system to best fit your production levels given the water quality and contaminants present in your water supply. 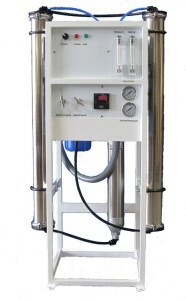 The Pure RO reverse osmosis water filtration system is very user friendly and features a unique design that allows to be very effective, efficient, and reliable. The system features basic, easily accessible electrical components and high quality NSF approved components making it extremely reliable. Unlike systems from many other manufacturers, the system does not include and fail-prone microprocessors or proprietary parts reducing operating and maintenance costs associated with reverse osmosis water purification systems. The Pure RO reverse osmosis water filter system is built upon ordering allowing our staff to customize and adapt the system for practically any application. Examples of this would be to modify the system to produce pure alkaline water or to include a water delivery system. 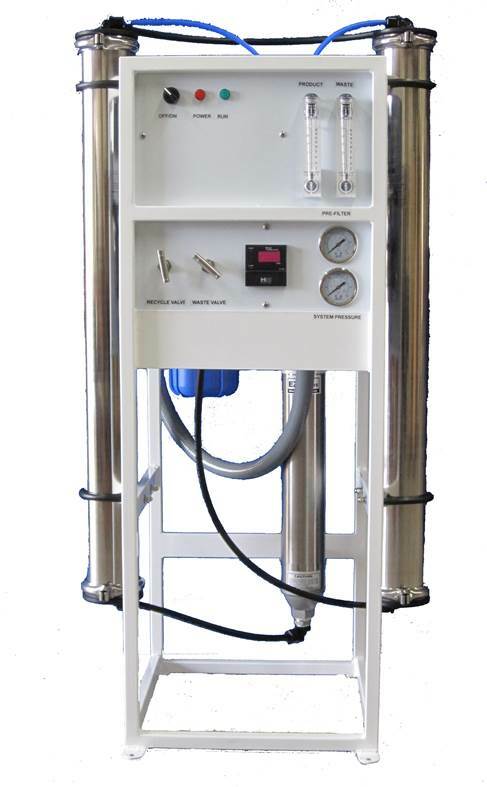 The Pure RO reverse osmosis water filtration system is designed, manufactured, and assembled in the USA with NSF approved components producing a very high quality and reliable water purification system. This reverse osmosis water purification system includes a 1 year manufacturers warranty on defective parts and include ongoing technical support via phone or email. The Pure RO water filter system also includes a detailed manual outlining user instructions, maintenance, and installation procedures. STEP 1: 5 Micron Pre-Filter— removes particles, sediment, and algae. STEP 2: R.O. Pump—high pressure, stainless steel RO pump to boost water pressure to 160 lbs. for maximum membrane efficiency. STEP 3: Reverse Osmosis Membranes— water is forced through a semi- permeable, .0002 micron membrane, allowing only pure water molecules to pass. STEP 4: Storage (optional)—water is stored in FDA approved tanks. STEP 5: Storage (optional)—water is stored in FDA approved tanks. STEP 6: Delivery Pump (optional)— a 20 G.P.M. pressure pump assures constant water supply from storage tanks to delivery source. STEP 7: Pressure Tank (optional)—33-gallon pressure tank assures a constant flow of water to the filler and prolongs pump life. STEP 8: Post-Carbon Filtration (optional) —water travels through a 4.5”x20” big blue Post Carbon filter, polishing it for exceptionally smooth taste. STEP 9: Ultraviolet Sterilizer (optional)— 25 G.P.M. 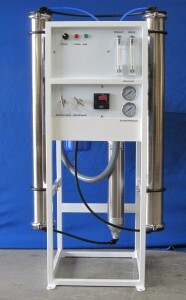 stainless steel sterilizer eliminates up to 99.9% of all bacteria. *Note: System flow rates are calculated based on 77 degree Fahrenheit incoming water temperature. Please call before ordering with any and all questions regarding the equipment, uses, specifications, installation, or any other questions. We have a very friendly and helpful customer service department that can be reached during normal business hours; Monday-Friday 8am-5pm PST.